How I focus with macro photos: Firstly I switch to manual focus. Then I manual focus to approximately the desired focus distance (usually the closest possible). Then I physically move the camera back and forth and take bursts of pictures. I move slow and in very tiny increments. This ensures that at least one of the photos is sharp and in focus. 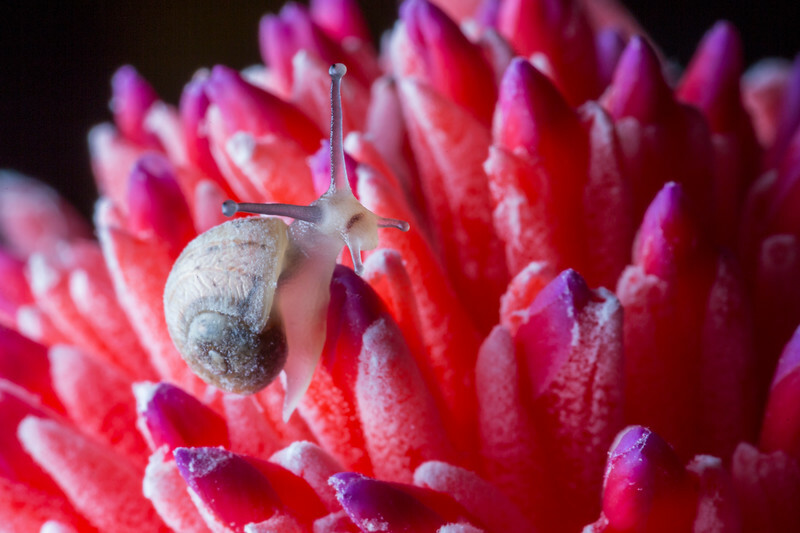 When using a small aperture in macro photography you will need a ton of light. Unfortunately getting very close usually causes you and your camera to cast a shadow on the subject. It is preferable to change your position. But to get a great shot you need the perfect point of view as discussed earlier limiting your moving abilities. In macro photography the background usually is completely out of focus thanks to the extremely shallow depth of field. In photography to create a compelling image attention on an appropriate background is key. Maybe even the most important part in any form of photography. 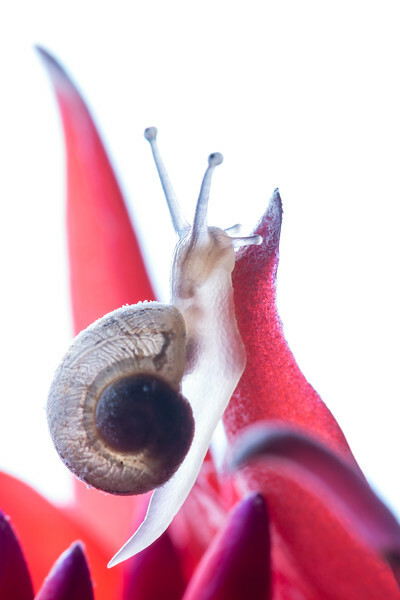 In macro photography as with most forms of photography the point of view (POV) is crucial. 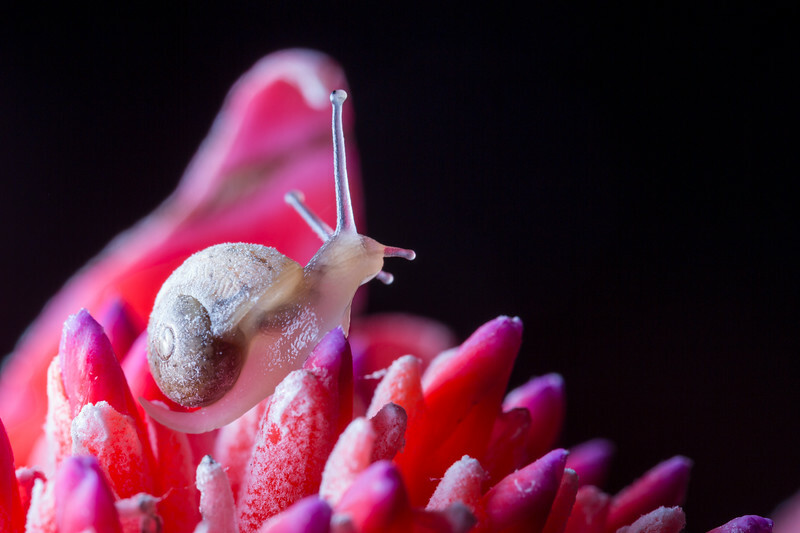 The angle between the lens and the subject changes the background and with macro photography it can make a huge impact on the distractions. The most unique problem of macro photography is the extremely shallow depth of field. When you get really close it becomes a massive problem or advantage depending on how you want to see it. In landscape photography with a wide angle lens and f/8.0 aperture you can easily get most of the scene in focus. In macro photography at just 1:1 magnification f/8.0 which normally sounds like a small aperture with a big depth of field, is now an extremely shallow depth of field. If you go down to f/22.0 at a very close focusing distance you definitely need some form of stabilisation and preferably a flash. The flash helps to increase the brightness for you to use a faster shutterspeed. You do not always need a ton of fancy gear. Macro tubes and Macro Filters are very inexpensive. 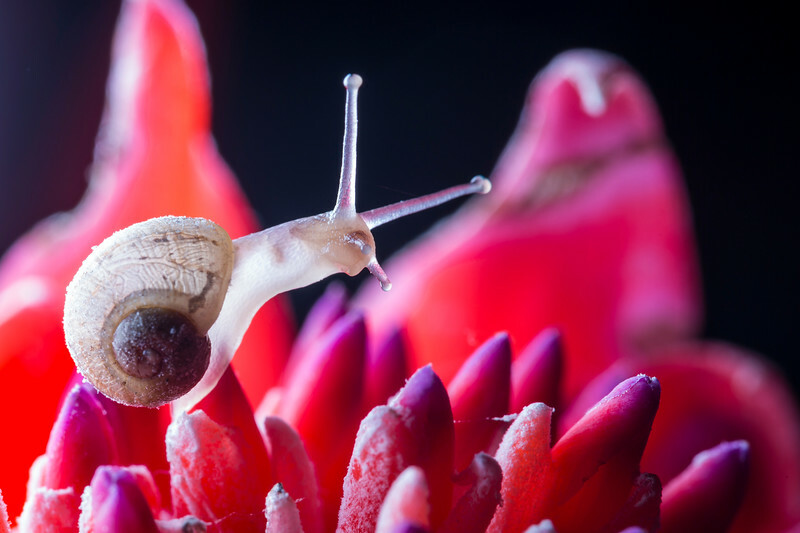 While it is not possible to get high quality photos with macro filters, macro tubes coupled with high quality glass can produce excellent shots. 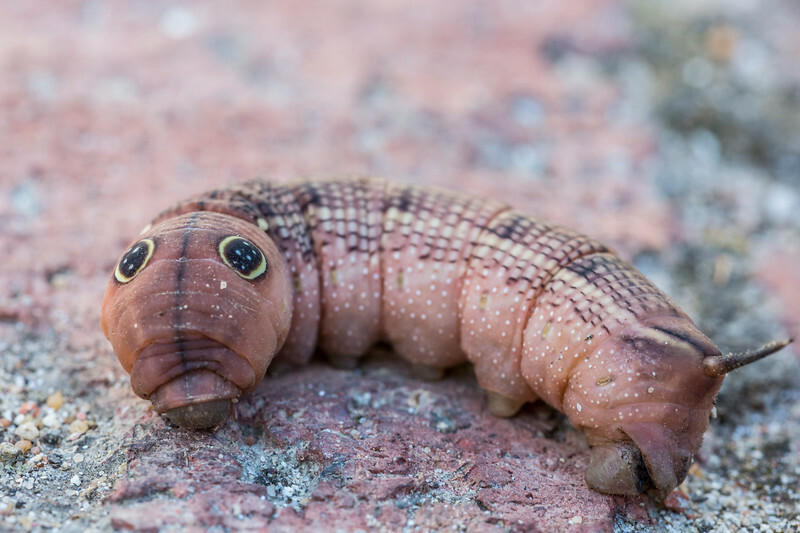 An extension tube is basically a small tube that fits between the camera body and the lens. This increases the distance between the camera’s sensor and the lens creating a closer focusing distance. Extension tubes come in varies shapes and sizes and depending on the lens’s focal length the magnification is affected differently. Macro photography is a very satisfying form of photography. It is fairly easy to capture an amazing macro photo. 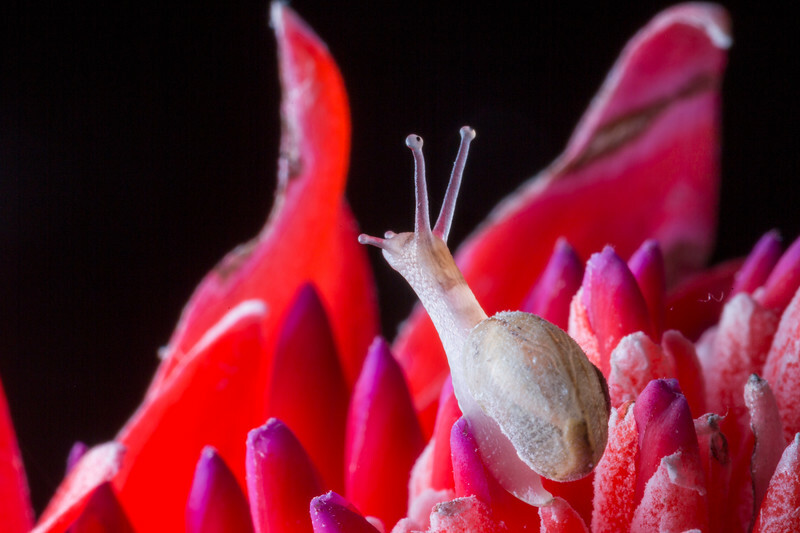 The macro photos show elements the naked human eye usually does not observe. Now focusing is probably the hardest part. Unless you have a Lytro camera with which you can refocus in post production. Auto focus usually does not work with macro photography especially if the scene is dark and/or you are darn close to the subject. I advise immediately switching to manual focus. This photo was taken in a forest in Magoebaskloof in South Africa. 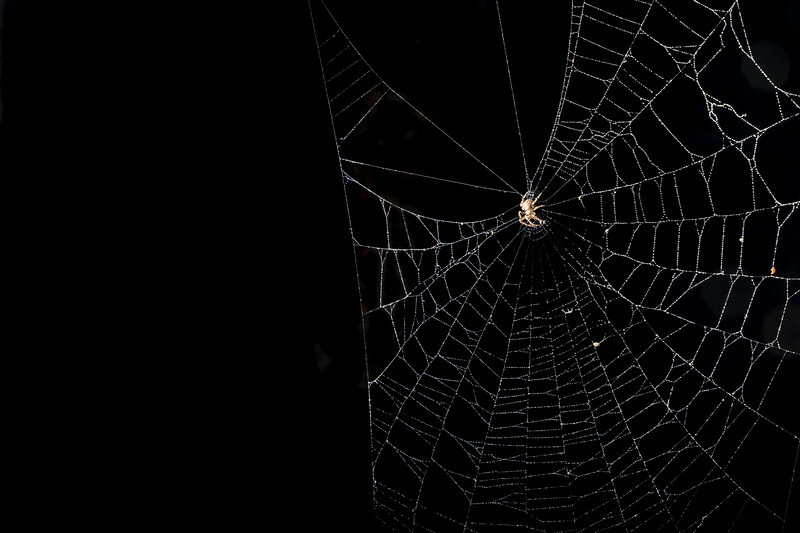 I was walking on a pathway in the forest and I almost walked into this spider and its web spanning across the pathway. 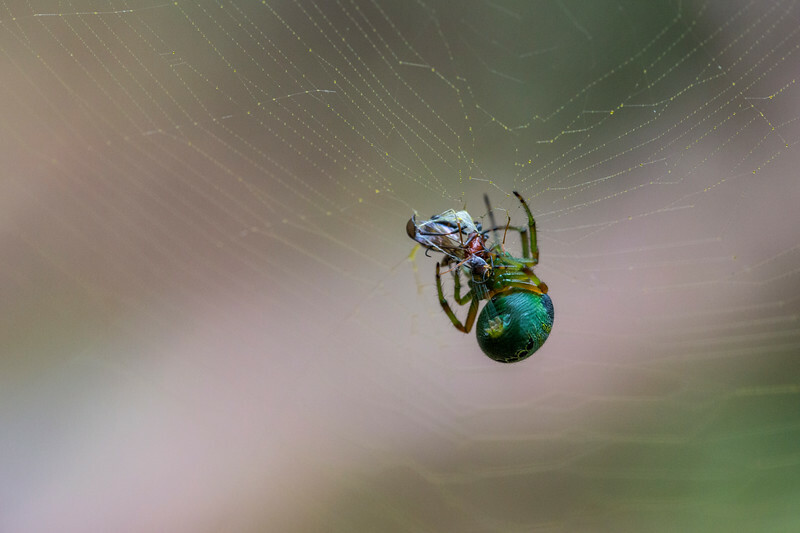 This green spider was busy eating an insect it just caught. I had my macro lens already on and ready to shoot. I immediately took a few photos from far and moved closer. This photo was not the closest of the set of photos but I chose this photo as the winner of the set as it was the best in focus. I took bursts of photos to ensure at least one of them is perfectly in focus. When shooting macro the depth of field is can be very shallow making it difficult to hold the camera still and the subject in focus. Just a slight movement and the focus can shift quite a bit. The light was not the best so I had a relatively small aperture and shallow depth of field. 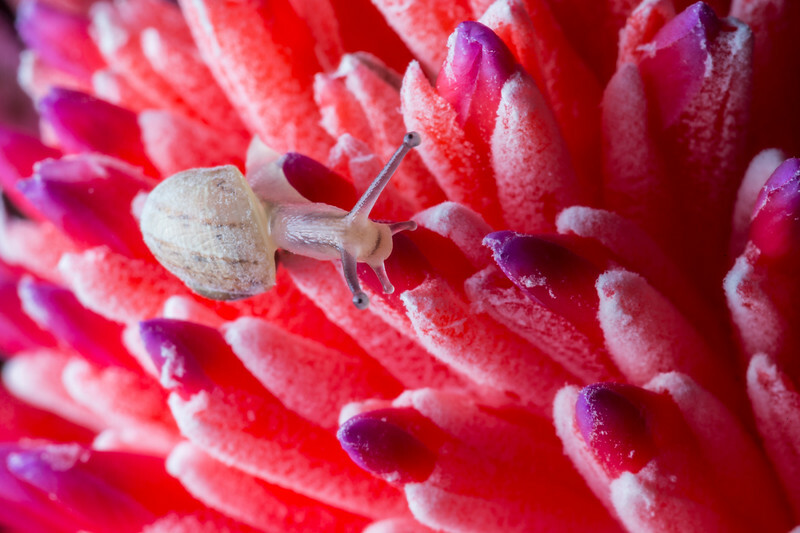 This photo was taken in December 2014 with a Canon 5D MkIII and TAMRON SP 90mm F/2.8 Di VC USD Macro. This spider with long legs was on the roots of a tree in the forest in Magoebaskloof next to the pathway I was walking on. 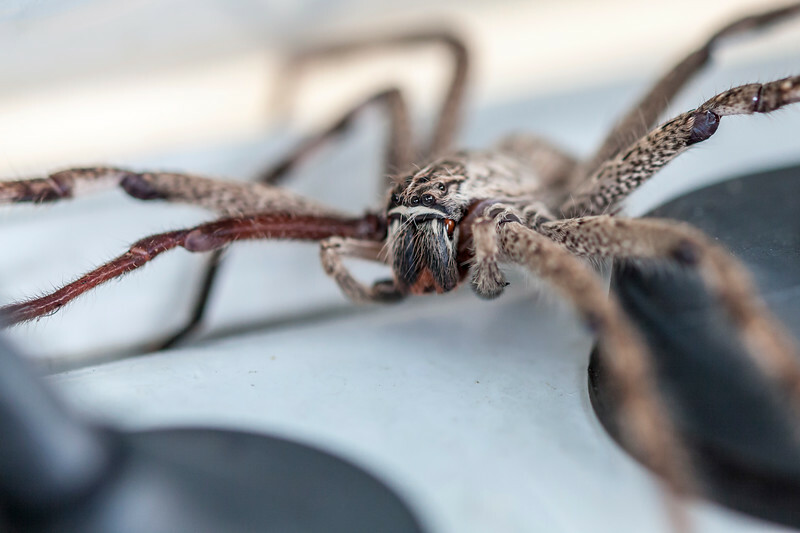 A very interesting looking spider I thought. 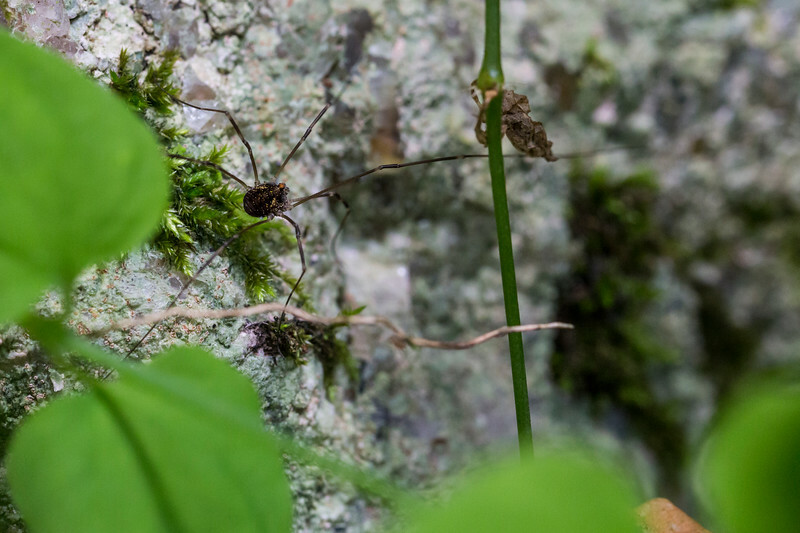 There was quite a variety of spiders in this forest. 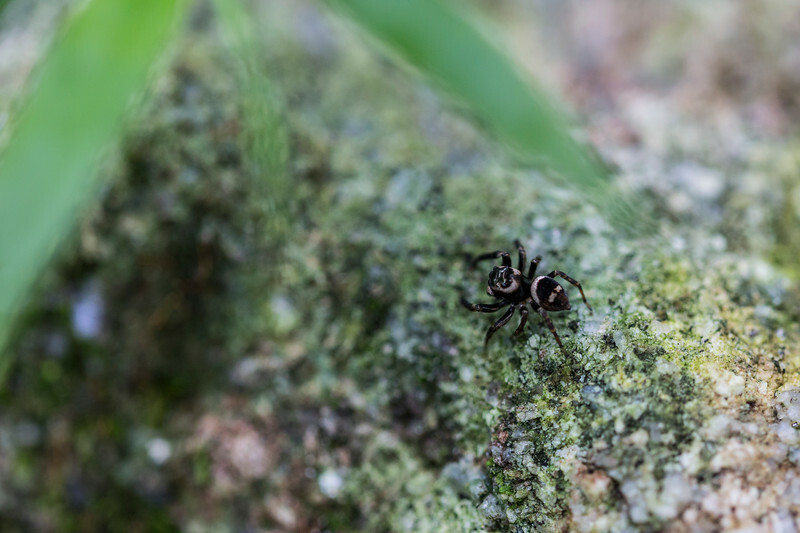 This small spider was found on a rock covered with moss in a forest in Magoebaskloof. This photo was taken at closest focusing distance giving a 1:1 life size photo on my full frame camera. The lens was set to its biggest aperture of f/2.8 giving a very shallow depth of field at such a close focus distance. 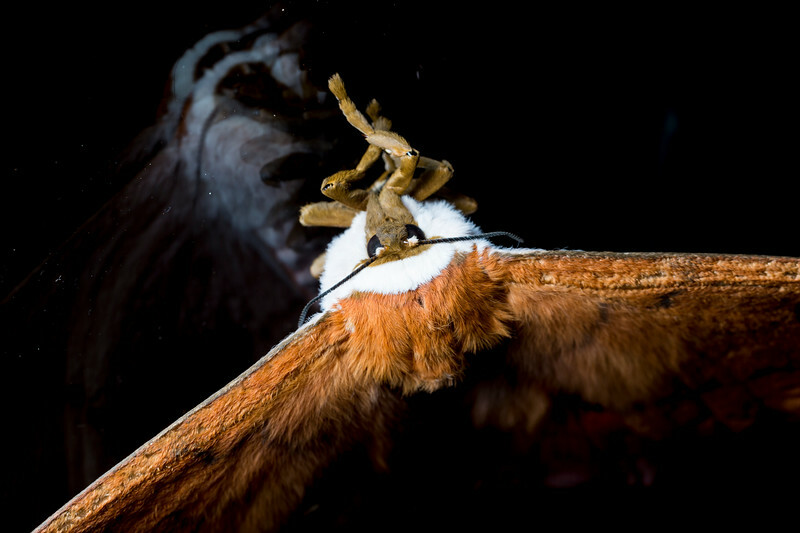 This photo of the big moth was taken on the window of a house in the Magoebaskloof forest where I was staying. I used a flash with a small softbox on. This photo was taken in a similar way as the photo I took of a grasshopper. I explained the method in detail in a previous post. Basically I held the flash with the small softbox on, in my left hand and with my right hand held the camera. I tried to get as close as possible without scaring away the moth. 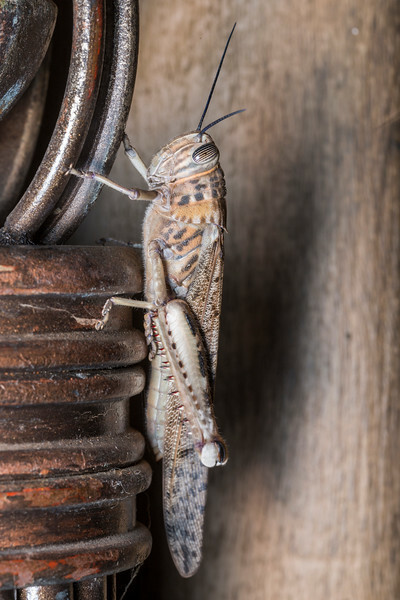 This grasshopper was on the railing of stairs to a doorway. This grasshopper matches the colour scheme of the rails making it a great place to photograph this grasshopper. 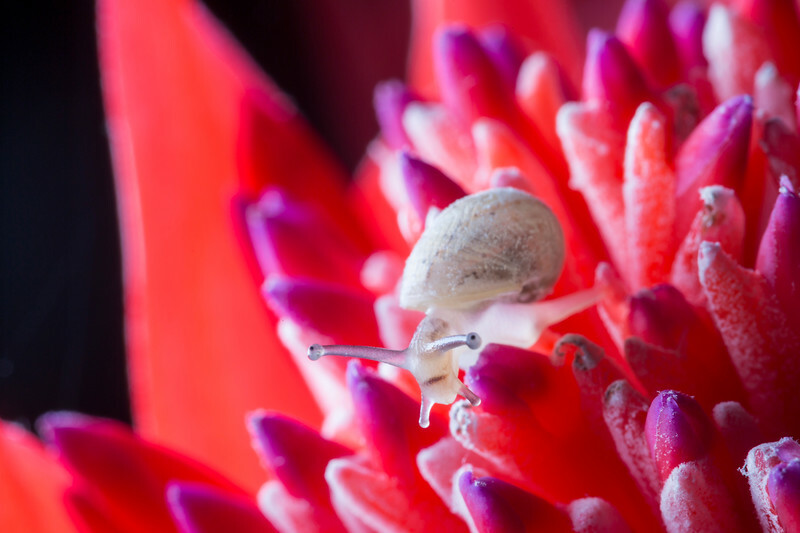 This photo was taken in June 2014 with a Canon 5D MkIII and TAMRON SP 90mm F/2.8 Di VC USD Macro. 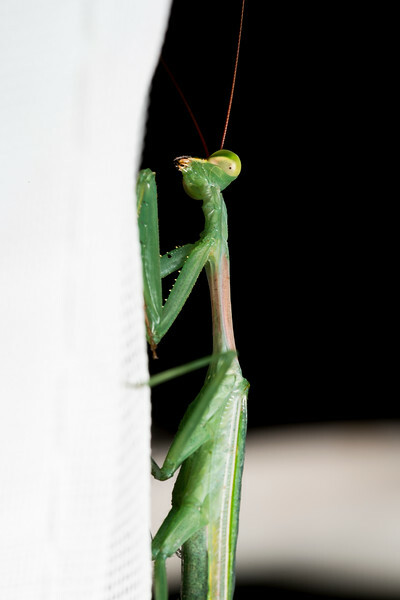 I used a macro lens and a Canon Speedlite 430EXII with a mini softbox on. The mini softbox was a LumiQuest Soft Box: http://store.lumiquest.com/lumiquest-softbox/. I held the flash in my left hand and the camera in my right hand. 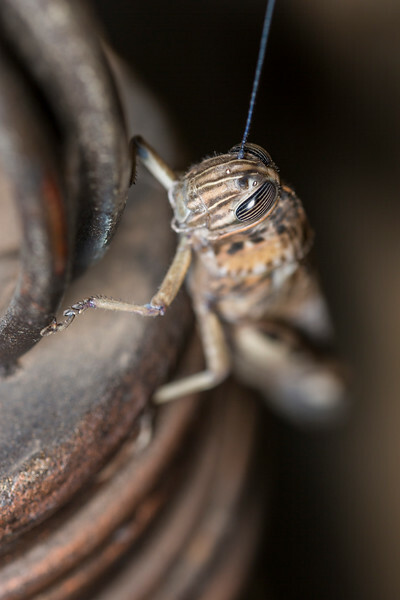 I used manual focus and held my camera until the grasshopper was in focus and then took the picture.